If you regularly need to lift heavy loads, whether it’s for a weightlifting hobby or as part of your job, you’ll be familiar with the worry that comes with putting so much strain on your back day after day. Just one back injury can disable you for life and cause chronic pain, so it’s really important to make sure that your spine and lumbar region are properly positioned and supported when you lift. An excellent way to be sure of this is to wear a back support. Existing back injuries can be helped by a back pain belt, as it will support your spine while it recovers and take a lot of the strain of lifting away from your lower back. This allows you to minimise your pain and get on with your life as normal without worrying that you will further injure yourself. Lanaform’s Thermo Technic belt features integrated reinforcements to provide a stable brace that you can rely on. 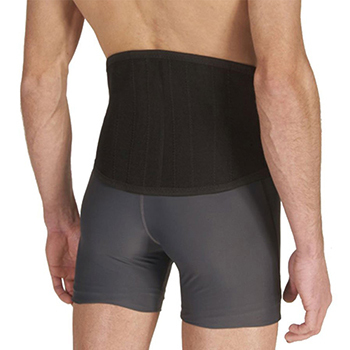 Lanaform’s Thermo Technic fabric features a three layer system that helps to insulate your back. The combination of a polyester outer, latex inner and polyester/cotton blend lining will keep your back muscles warm and supple. This allows for quicker healing and keeps you ready for physical activity, as it encourages blood flow and keeps your muscle fibres elastic so that they aren’t easily strained. Available in 4 different sizes, this belt features an adjustable tightening system so you can find your perfect fit and level of support for your back. It can be hand washed at 30 degrees, so it’s easy to keep clean and fresh. Suitable to wear under or over clothing, the cotton blend lining ensures that it feels soft next to your skin.